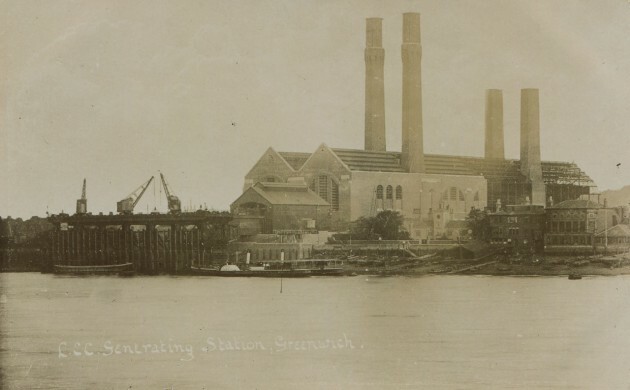 In 1902, work was started by the London County Council (L.C.C) on the construction of a Power Station (Generating Station) at Greenwich for the supply of electricity to their tramways. Built on the banks of the River Thames at a distance of just half a mile from the Observatory and exactly on the line of the Greenwich Meridian its location was detrimental to the operation of the Observatory. As well as the obvious problem of turbulent air and smoke from the chimneys, there was also a problem of vibration. What seems rather curious is that no one associated with the Observatory was formally consulted about the location. Nor was anyone consulted about the design and nor did they ask to be. Even more curious, is that despite the fact that the Power Station was being built right under his nose, William Christie, the Astronomer Royal, only started to raise objections in 1905 when phase one (of two) was nearing completion. In 1906, he shared his concerns with the Board of Visitors at the visitation which took place on 30 May. By this time, phase one (the northern section) was largely up and running, having been officially opened just a few days earlier on Saturday 25 May. As was the norm, details of the visitation were reported in the press. In the ensuing weeks, numerous follow-up articles about the impact of the Power Station on the Observatory were published and questions asked in Parliament. In all the hullaballoo, the finger of blame when pointed, was largely directed towards the L.C.C. Very few asked why Christie, the Admiralty and the Board of Visitors were so slow in raising their objections ... and those who did ask, do not receive an answer. A Parliamentary inquiry rapidly ensued. It made a number of recommendations in order to mitigate the impact of the Power Station on the Observatory. These included finishing the two chimneys of the yet to be completed phase two at a lower height than originally planned as well as taking steps to reduce vibrations. Under the Tramways Act, 1870 local authorities were permitted to acquire privately operated tramways in their area after they had been operating for twenty-one years. The London County Council, which had come into existence in 1889, acquired its first tram company by this means in 1895 and by 1909 owned most of the tramways in London. 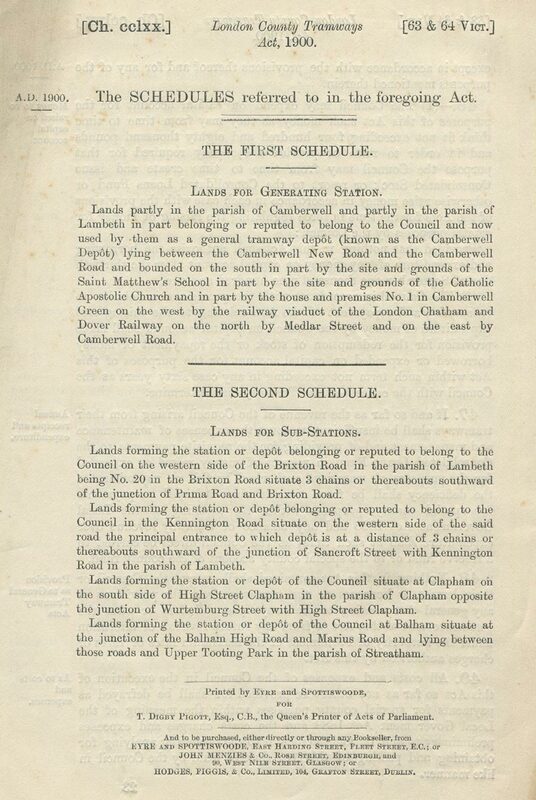 The London County Tramways Act, 1900 gave the Council, powers to electrify certain tramways and to construct a generating station on the site of its tramway depot at Camberwell (but not elsewhere) to supply them. For various reasons, the Council later decided that their tram depot on the banks of the Thames at Greenwich, together with some adjacent properties (that they would need to acquire), would make a better site for the generating station. Amongst the advantages was that the river frontage would be convienient for the delivery of coal, the removal of ash and the supply of water for the condensors. 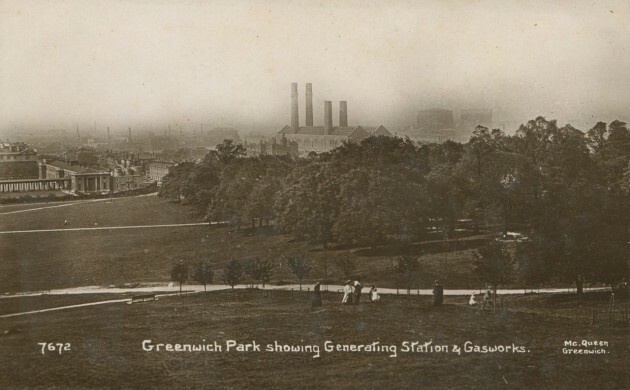 Prior to its completion, power for running the newly electrified section of line through Greenwich was obtained from the generating station operated by the London Electric Supply Corporation at Deptford (RGO7/66). 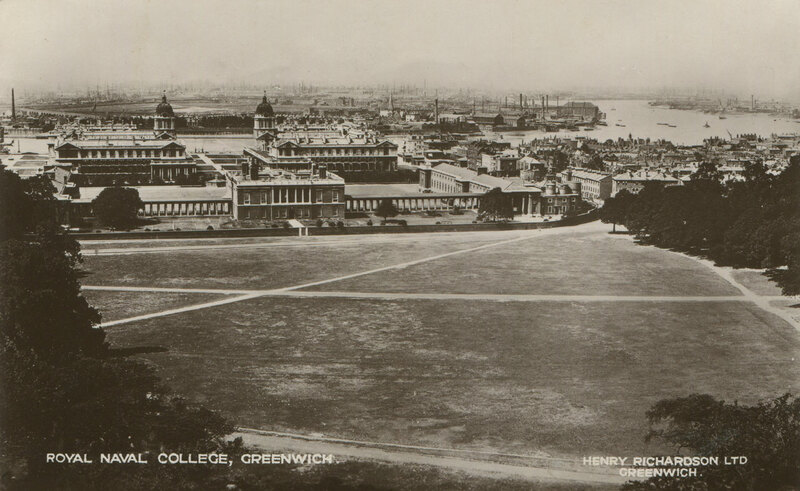 The tram depot at Greenwich (opened 13 December 1870) stood on land formally occupied by Crowley House and had been acquired by the L.C.C. when it took over the London Tramways Company at the start of 1899. They in turn had acquired it as part of the assets of the Pimlico Peckham & Greenwich Street Tramway Company which they took over in 1873. Work on constructing the Power Station began almost immediately after the act of 1902 had been passed and by the end of 1903, the first two chimneys were nearly completed (RGO7/65). Although the height and position of the chimneys was one of the things Christie objected to, it was not until 2 November 1905, after another two years had passed, that he raised the matter for the first time with the Admiralty (RGO7/66). What seems to have prompted his action was a report, about a visit to the Power Station by a group of Councillors from Paris, that appeared in 20 October edition of the Kentish Mercury. It seems that it was only at this point, that Christie realised, that what had been built so far, was only half of what was planned. What alarmed him further was an article in The Times on 30 October followed by another the following day that mentioned the Council’s proposal to seek Parliamentary powers to enable it to supply electrical power to a wider market. Although there was no mention of where this power would be generated, Christie pressumed it would come from ‘a huge generating station at Greenwich’. In his letter of 2 November to the Admiralty, Christie stressed that there was nothing in the 1902 act to indicate that the Power Station would be of ‘abnormal size’ with ‘exceptionally high chimneys’. He had, it seems, naively expected something similar to that of the rather smaller power station that had been built about on the river at Deptford around a mile to the north-west of the Observatory. 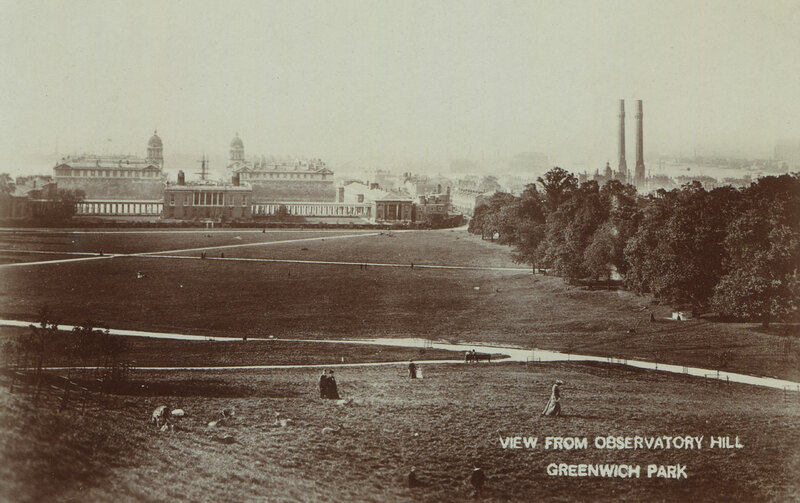 Since its opening in 1889, (when it was London’s biggest power station), it had had, so Christie claimed, no discernable impact on the Observatory (more on this below). At about 150 feet in height, its chimneys were not only some 100 feet lower than those that had been built at Greenwich, but their tops were below the level of the Greenwich instruments. 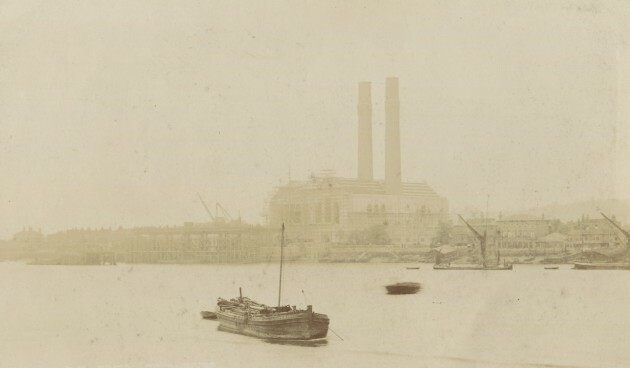 Whilst the two completed chimneys of Greenwich Power Station were close to the Meridian of the Airy Transit Circle, they did not directly block the view along it. The issue here, was going to be one of turbulance in the atmosphere as a result of the hot gases coming from it once the Power Station came into use. The situation with the two that remained to be built was rather different as the most westerly of them would directly block the view of the Altazimuth when it was aligned to the north along its meridian. Later, Christie was to stress the importance of the Greenwich Meridian as defined by the centre of the Airy Transit Circle together with the international obligations arising from its adoption as the Prime Meridian of the World at the 1884 International Meridian Conference. The subsequent adoption by many countries of a standard time based on the time on the Greenwich Meridian, in his opinion, strengthened those obligations further. Because of this, Christie argued, the Airy Transit Circle was sacrosanct and should not under any circumstances be moved and that if anythng had to be moved it must be the Power Station rather than the Observatory (for more on this see below). As soon as they became aware of the conflict of interests, the Admiralty set in train a series of meetings with the L.C.C. with a view to resolving the dispute in a way that satisfied all of the parties and hopefully avoided any litigation. It soon became apparent that the height of the chimneys and the smoke they produced was only going to be part of the problem. 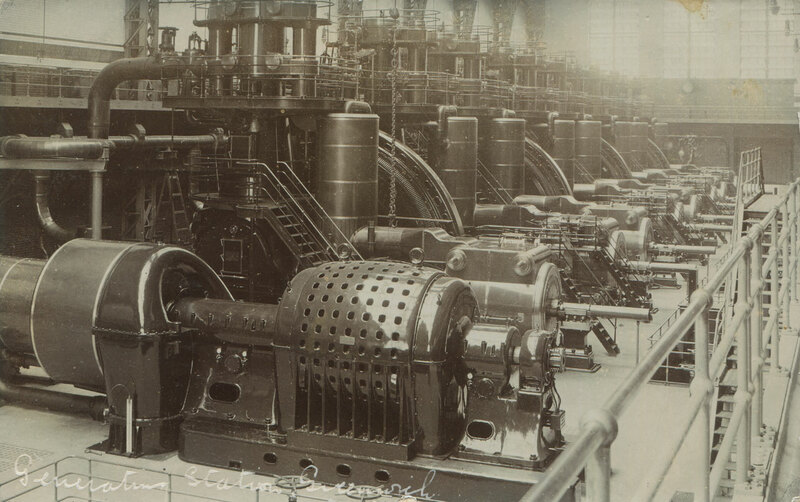 Rather than use balanced turbine-gnerators, for phase one, the Council had chosen to install four less up to date vertical-horizontal steam reciprocating engine sets driving a flywheel-type alternator. 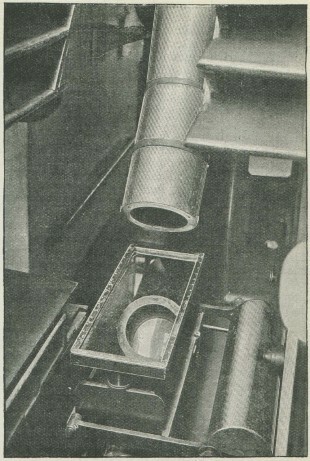 These had the distinct disadvantage, from the observatory’s point of view, that they were unbalanced and would potentially cause problems with vibration. It was arranged that as soon as the first of them was up and running, a series of vibration tests would be conducted in cooperation with the L.C.C. engineers. One was run for the first time on 23 March 1906. The vibrations from the engines caused tremors in the surface of the mercury used by the four instruments where observations were made by reflection the – Airy Transit Circle, the Altazimuth, the Reflex Zenith Tube and the small transit in the pavilion in the courtyard. This was particularly serious as if was from these observations that the level errors of the instruments were obtained. On the 30 April, the first known mention of the problem appeared in the press in a general article about the nuisance of smoke from London’s growing number of power stations. 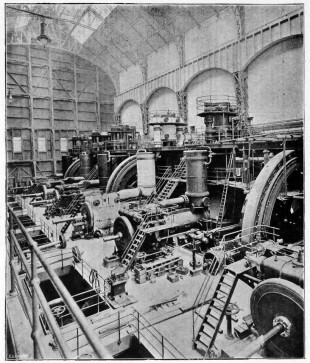 This was published in The Daily News and carried a photograph of the new power station at Greenwich, the caption of which ended with the sentence: ‘It is contended that these works almost cut the meridian, and interfere with the work of the Observatory.’ As far as is known, this was neither followed up by The Daily News, nor was it picked up by any other newspaper. 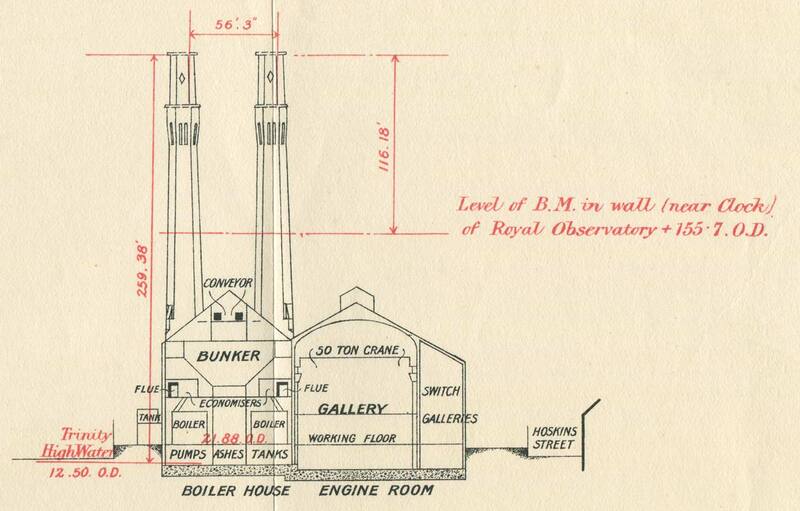 ‘The continued efficiency of the Observatory is seriously threatened by the schemes for the supply of electric power to the whole of London and surrounding districts from generating stations planted, or to be planted, in the immediate neighbourhood of the Observatory. 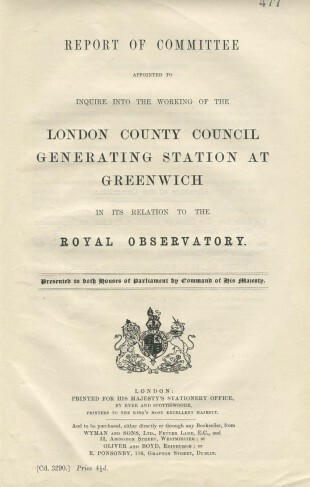 Amongst these the most serious danger arises from the generating station of the London County Council, which is planted exactly in the Greenwich meridian, in a position where its excessively tall chimneys will, unless their height be materially reduced, interfere with observations of stars near the north horizon (which are essential for latitude and refraction) and will, through the effect of heated air, render the results untrustworthy. A reduction in the height of the chimneys (possibly accompanied by the introduction of forced draught) would provide an obvious remedy for this interference with the Greenwich meridian work. 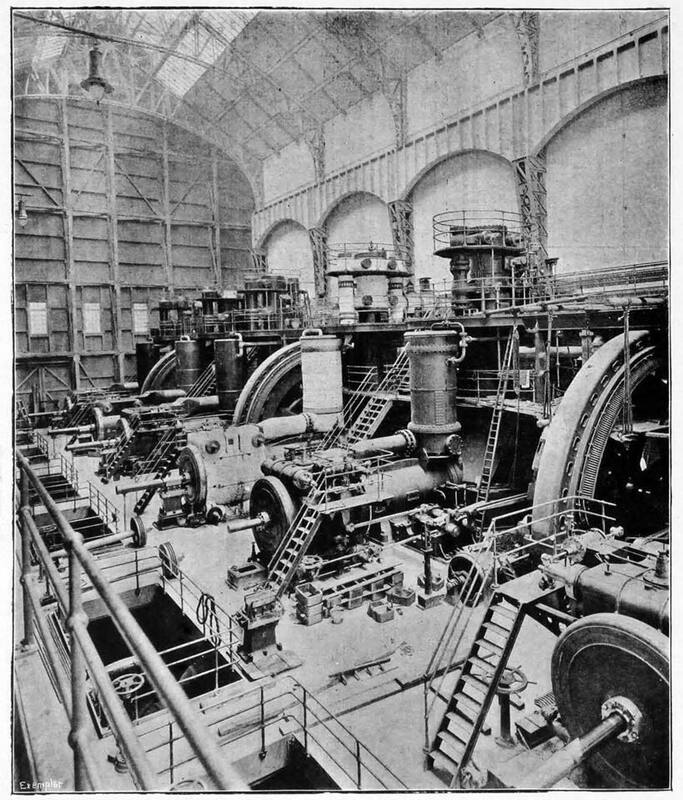 Further, as this generating station is at a distance of only half a mile from the Observatory, there is grave risk that vibrations from the extremely powerful engines which are being installed there with a view to the supply of electric power wholesale to London, though authorised only for the requirements of the tramways [this was not stictly true], will seriously affect the value of observations by reflection from a mercury horizon, which are essential tor the fundamental work of the Observatory. 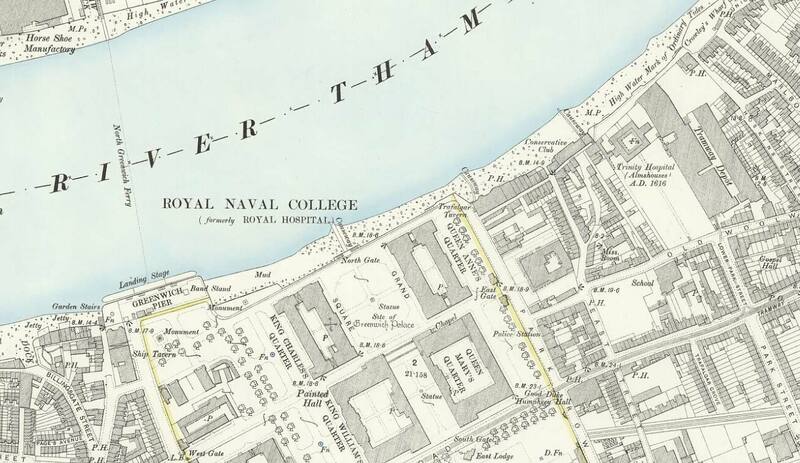 Tests which have been made show that, even with the small portion of the engineering plant which is now available tor work, serious tremors are produced, and though it is hoped that these may be reduced by improved working of the engines, the alternative of providing a remedy for interference in this way with the Greenwich meridian work may have to be faced. It is to be noted that no such tremors have been detected from a generating station at Deptford on a much more modest scale, which has hitherto sufficed to supply the London Council Tramways with electric power, this station being at a distance of nearly a mile from the Observatory. As was the norm, after the meeting, the Astronomer Royal’s report was circulated to the press. In the case of The Times, a brief report appeared the following day and a fuller one on 1 June. In the meantime, on 31 May, The Standard, The Tribune, The Daily Telegraph The Morning Leader, The Daily Graphic and The Westminster Gazette had all published much fuller stories about the threat to the Observatory. On that same day, H.H. Turner, a former Chief Assistant, Savilian Professor of Astronomy at Oxford and member of the Board of Visitors had penned a letter to The Times. This was published on 2 June. Sir, – The Board of Visitors of the Royal Observatory at Greenwich found themselves confronted, at their annual meeting yesterday, by a grave anxiety. The London County Council have established in the Greenwich meridian and within half a mile of the Observatory a large station for generating electricity. There are already two chimneys 250ft. high, which rise from the river bed above the domes of the Observatory, in spite of the 150ft. of hill on which the latter is placed; as well as two other chimneys somewhat smaller, The disturbance caused by the hot air and smoke from all these chimneys cannot fail to be serious, though it is at present impossible to estimate it quantitatively. But there is another source of disturb­ance of an alarming kind of which direct evidence has already been obtained. In spite or various precautions taken, the engines of the generating station are so powerful that they shake the Observatory. The delicate observations for nadir, which furnish the reference points for Greenwich time and for terrestrial longitudes, indicate a state of constant vibration while the engines are running, which will, be greatly increased if the full proposals of the London County Council are carried out. 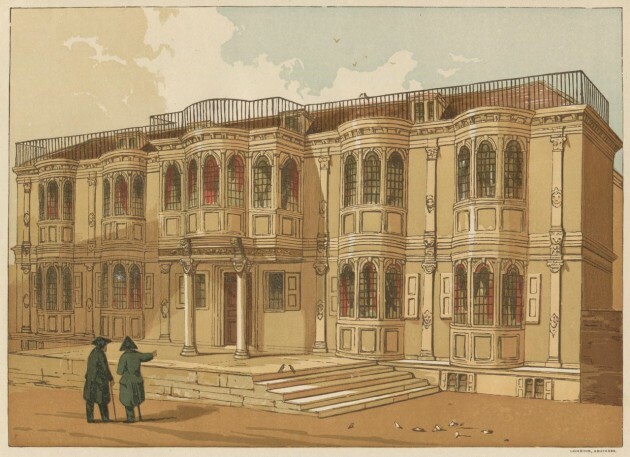 By the invitation of' the Astronomer Royal I paid a special visit to Greenwich on Tuesday and was able to com­pare for myself the state of matters during the running of the engines and after they had been stopped, (i.e. after midnight). The Observations left no room for doubt as to the seriousness of the disturbance. In one important respect the Board of Visitors had reason to be well-satisfied. They learnt from the Astronomer Royal and from the Hydrographer to the Admiralty [a member of the Board] that the Admiralty are deeply concerned about the threatened danger, and are using their influence to minimize it. The duty of the board, therefore, which is to report to the Admiralty, resolved itself in this instance into a simple expression of their hearty concurrence with the steps already taken, and an earnest hope that they might be successful. But it is clear that matters of grave public import­ance are at stake, and I hope there is no impro­priety in my addressing to you, unofficially, but as a person having knowledge of the facts, some remarks on two points on which it seems probable that the public will desire some information. The first point might be formulated as a natural question: – How has it happened that a scheme threatening such danger to the Observatory has advanced so far towards realization? This is a question which must be frankly faced some time or other; for there is no blinking the fact that there is a conflict of interests on a very large scale, and a serious sacrifice will have to be made on one side or the other. But it is impossible to consider this question adequately here. I do, however, wish to ask whether another question should not precede it – namely, what should be the attitude of the London County Council towards the existing institutions of London? To this, there was no reply. The architect referred to was William Riley who in 1877 had joined the staff of the Director of Engineering and Works of the Admiralty, and rose to the rank of Assistant Director. In 1899 he had been appointed as ‘Superintending Architect of Metropolitan Buildings and Architect to the London County Council’. 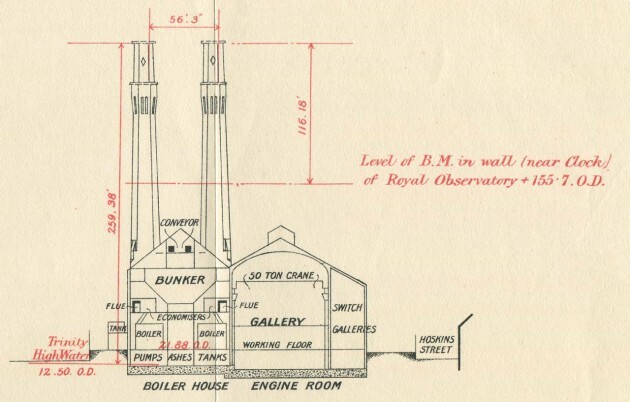 Whilst it was true that Riley had had input into the recently constructed New Physical Building and Altazimuth Pavilion at the Observatory, he had had no input into the selection of the site for the Power Station. Once this had been pointed out to Crawford, a graceful apology was issued via a letter to The Times (which had earlier reported on the debate). As well as being reported in Hansard (as was the norm), the debate was also reported in the July 1906 edition of The Observatory. This, it is worth noting, was the magazine that had been founded by Christie and whose editors Thomas Lewis and Henry Hollis were both Assistants at the Royal Observatory, Greenwich. As such, its impartiality on the matter has to be questioned. Within weeks of the meeting of the Board of Visitors, a Parliamentary Committee had been put together. It had just three members: The Earl of Rosse (representing the Royal Observatory), Sir Benjamin Baker (representing the London County Council) and James Alfred Ewing (representing the Admiralty). The 4th Earl of Rosse, Lawrence Parsons, was an astronomer and one of the Observatory’s visitors who had served on the Board since 1886. Baker was a civil engineer and Chief Engineer of the Council and probably best known today as the designer of the Forth Bridge. Ewing was a physicist and engineer who in 1903 had been appointed by the Board of the Admiralty as Director of Naval Education at the Royal Naval College Greenwich, having previously been Professor of Mechanism and Applied Mechanics at the University of Cambridge. 1. 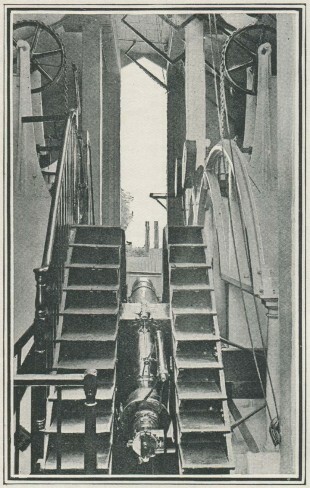 To inquire into the working of the engines now in position at the London County Council Station, and the amount of vibration caused by them, and what detrimental effect they have, if any, on the instruments in the Royal Observatory, and whether such disturbance, if found to exist, is caused by the station engines alone, or arises in whole or in part from other causes. 2. To inquire into the anticipated amount of vibration, and consequent detriment to the Observatory which may be caused when the station is in full working order. 3. To inquire into and ascertain the mode in which such vibration is produced and is conveyed to and affects the instruments used in the Royal Observatory, and to consider how, and by what methods, steps can be taken for preventing or neutralising it, either at the source or elsewhere, by alteration in the machinery used at the station or otherwise. 4. To consider how far any smoke or heated air from the chimneys belonging to the generating station, or the physical obstruction of the chimneys themselves, may be expected to interfere with observations from the Observatory, and to consider by what means this interference can be abolished or modified. (a) The question, both as regards effects of vibration and obstruction through chimneys or discharge from chimneys, to be further reviewed after, say, two years, by which time experience should be obtained with the second portion of the station at work. (b) The generating plant for the second portion to be turbines which, as well as the dynamos, must be of a perfectly balanced type such as has been proved by trial not to cause vibration. (c) An undertaking to be obtained that when the plant in the second portion is available for use, the reciprocating engines of the first portion shall not, in ordinary circumstances, be used after 10 p.m. and their use shall be restricted as far as possible after 8.30 p.m.
(d) The two chimneys of the second portion, at present incomplete, to be not higher than 204 feet above Ordnance datum. (e) The discharge of gases both from these and from the existing chimneys not to be materially hotter than the discharge is now from the existing chimneys, namely, about 250º Fahr. (f) No further extension of the station to be made beyond the 20,000 kilowatts now contemplated in the equipment of the second portion. The recomendations were subsequently accepted by both the Admiralty and the L.C.C., with the later finally agreeing to them in October 1907 (RGO7/66). Fortunately for all concerned, experiments conducted on the design of the mercury troughs showed that the tremors in the surface of the mercury could be eliminated by altering the profile of the bottom surface and the depth of the mercury they contained. More details on this can be found in the Committee’s report (link above). 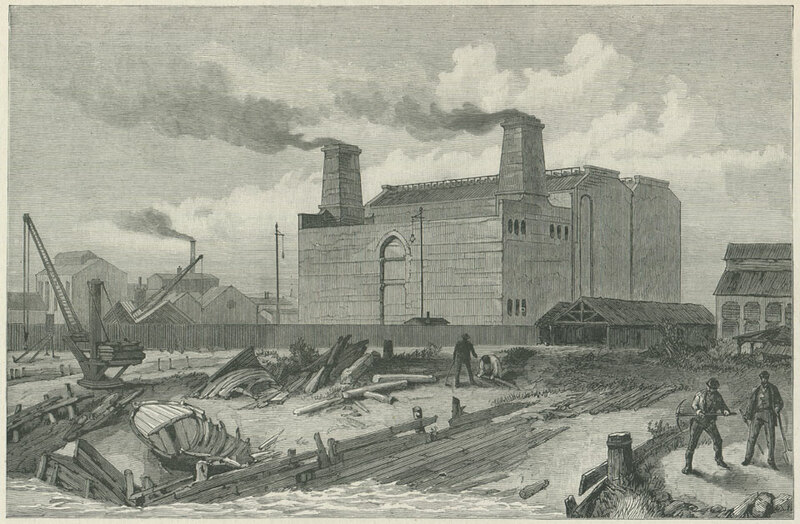 Built from London stocks, with Portland stone cills, copings, and dressings and a roof covered with Bangor slate, the completed Power Station had a total volume of 9,670,000 cubic feet. An early example of a steel framed building in Britain, it is today generally admired by architectural historians. The tapered octagonal chimneys as designed had crisply corbelled and machiolated tops. The decision not to complete the southern pair to their full height had a hugely disfiguring effect on the building’s overall appearance. 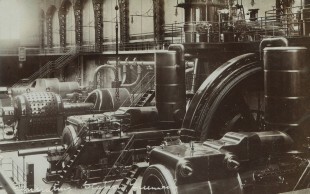 Phase two is believed to have been completed in about 1910, about a year after the two photographs of the turbine hall below were taken. The total cost as estimated in 1906 was £900,000. With regards to the turbines used in phase two; although the Committee recommended the use of balanced turbines, the decision to use such plant in phase two had in fact already been made before phase one was officially opened. Although today the question of air quality is high on the political agenda, this was not the case when the Power Station was built. No thought at all seems to have been given to the potential increase in air pollution that was likely to occur by failing to build the southern chimneys to their originally intended height. A failure of corporate memory? 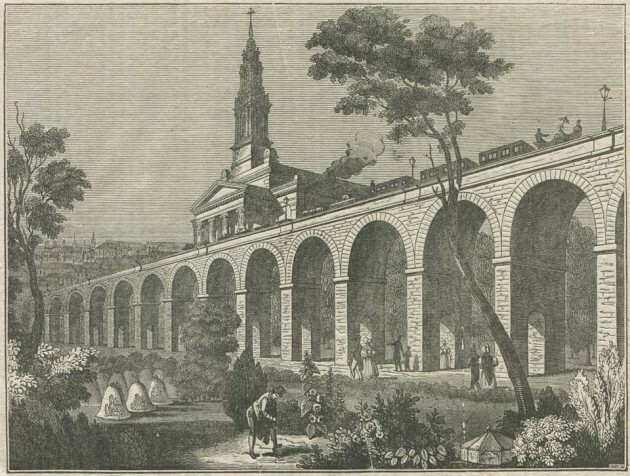 As long ago as 1835, while the London and Greenwich Railway was still under construction, proposals had been under discussion for a line that would cross Greenwich Park on a viaduct between the Queens House and the Observatory. The proposals were considered by the Astronomer Royal (John Pond) and the Board of Visitors, both of whom raised their objections on the grounds that vibrations from the trains would almost certainly interfere with the observations by reflection that were made with the two Mural Circles. So concerned were the Visitors that they asked one of their number, Captain Beaufort, to investigate the matter further. A series of tests were therefore carried out on his behalf alongside the Liverpool & Manchester Railroad. 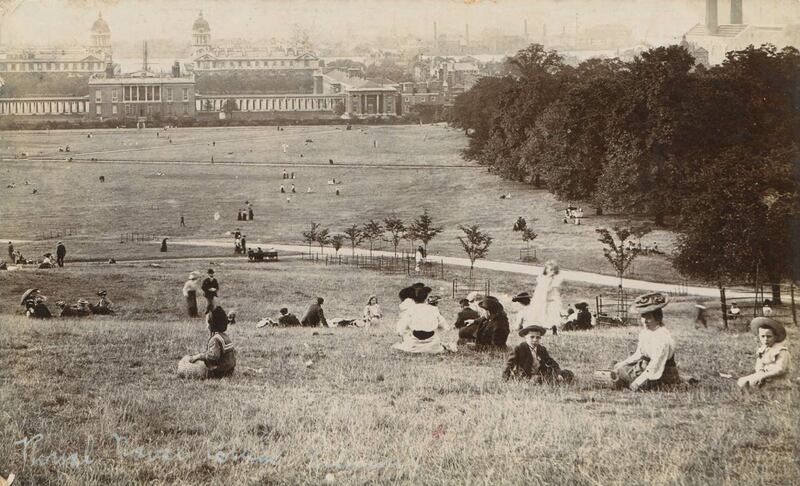 The results suggested that vibrations from trains running across Greenwich Park would almost certainly affect the Observatory. 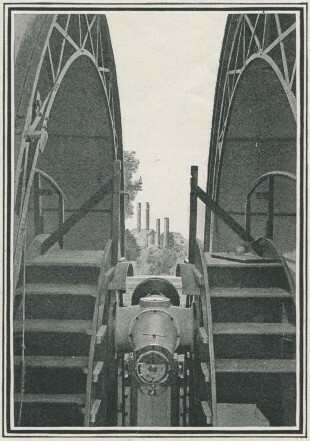 On the 25 January of the following year, George Airy, the new Astronomer Royal, conducted further tests in the Glebe Meadow near the Surrey Canal and about 200 feet south of the London and Greenwich Railway, which by then was carrying test trains prior to its partial opening in February. They too suggested that there would be an impact, but that it could be mitigated by ensuring a minimum distance was maintained between the Observatory and the railway and that the trains be restricted in both their speed and their times of passage. 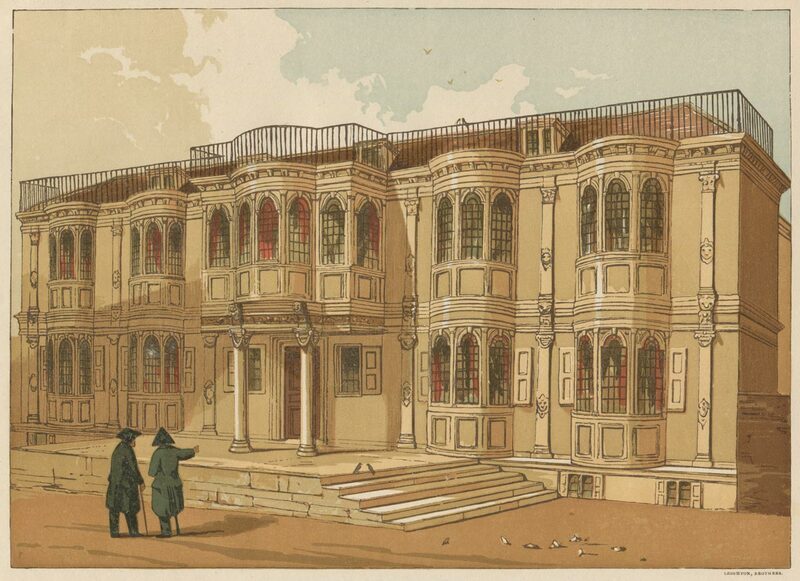 The proposals continued to be pushed forward in various forms for the next 30 or so years and involved various further tests including a series that Airy undertook at Kensal Green in 1846. In the meantime, a line was built around the Park connecting the North Kent coast to London via a tunnel that ran from Charlton to Blackheath. This line, opened in 1849. 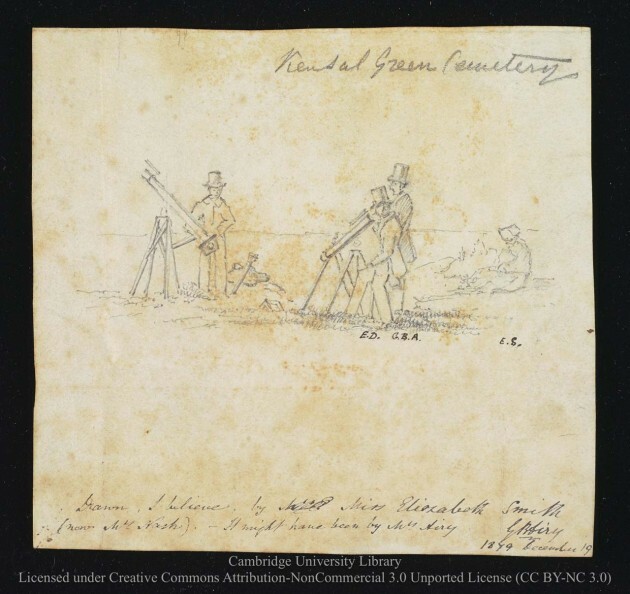 In 1863, in response to yet another proposal to tunnel under the Park, Airy conducted further tests in two new locations, the two sites having similarities in soil structure with that of the Observatory. They were near the entrance to the existing Charlton to Blackheath tunnel by Morden College in Blackheath and near the Metropolitan Railway at the upper end of Portland Place near The Regents Park. From these experiments Airy concluded that any new tunnel should not pass closer to the Observatory than 1,000 feet. 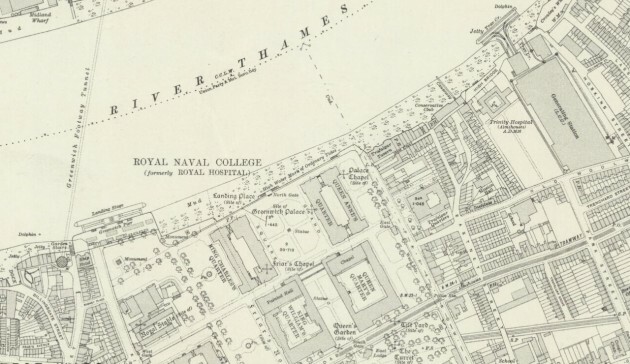 In the end, plans for a tunnel across the Park were abandoned and the line from Greenwich extended instead via a tunnel that passed under the grounds of the Royal Hospital School (now the National Maritime Museum). This eventually opened in 1878 and passed at a minimum distance of 570 yards from the Transit Circle. 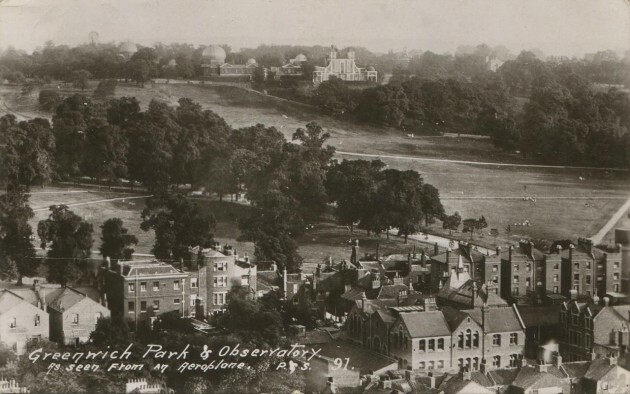 Further tests were carried out in 1888, when amendments to the 1887 Bexley Heath Railway Act were being discussed in parliament as a result of a proposal to build a new tunnel under Blackheath that would pass within 840 yards of the Observatory. 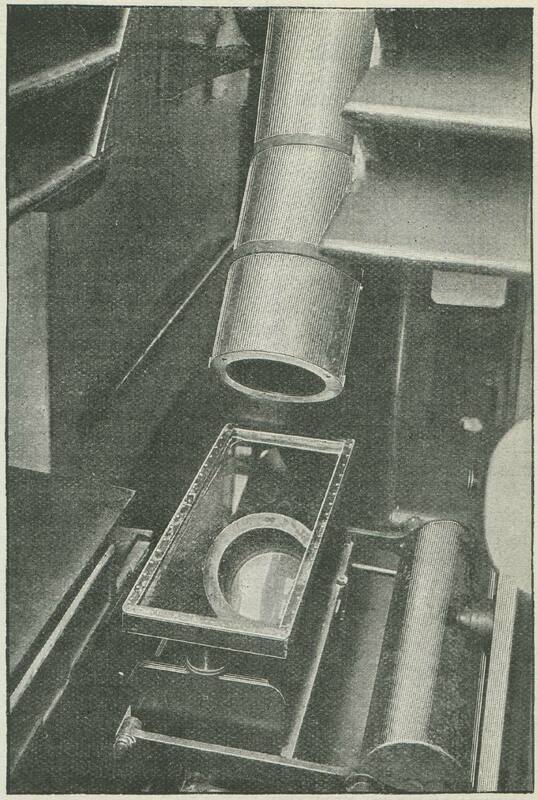 This time, tests were carried out by Christie at the Observatory itself, using the Airy Transit Circle (RGO7/59). Worryingly, it was found not only ‘that the disturbance was very great during the passage of trains between Greenwich and Maze Hill’, but that ‘there was considerable disturbance during the passage of trains through the Blackheath-Charlton tunnel, at a distance of a mile.’ As a result, firstly, the construction of the tunnel was not allowed and secondly modifications were made by Christie to the mercury troughs of the telescopes to damp out the vibrations. Trains however weren’t the only source of troublesome vibrations. Back in 1851, Airy had had to contend with the problems of vibrations with his newly installed Reflex Zenith Tube. Installed in small room next to the new Transit Circle, every time the adjacent courtyard gates were opened or shut, a jarring of the mercury would result. 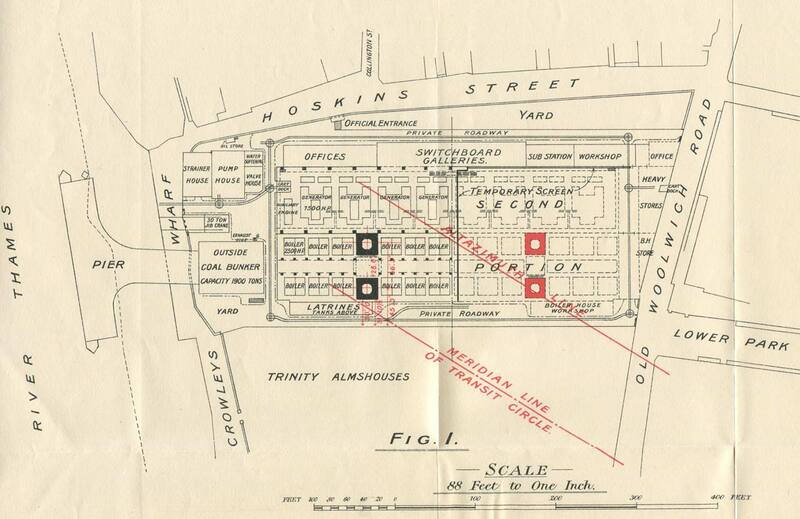 In 1853/4, Airy decided that a new room for the telescope should be constructed on the other side of the Transit Circle roughly 12 metres further from the gates. Here too there were problems, with the mercury suffering from an intolerably large and never ceasing tremor. It was eventually realised that the vibration problem was a result of the very structure of the hill itself, its compacted mix of sand and pebbles leading to the ready transmission of vibrations and tremors. The problem was eventually mitigated by backfilling the pit in which the mercury trough had stood with ‘incoherent rubbish’ and then suspending the mercury trough on a complex arrangement of staging. Interestingly, the problem of transmitted vibrations does not appear to have affected the mercury troughs that had been used with the Mural Circles since 1822, nor the Transit Circle that replaced them. Given the long history of both dealing with vibrations and seeing off schemes that would directly impact the work of the Observatory, one has to ask, when it came to the question of Greenwich Power Station, was it a question of complacency on the part of the astronomers or was it a failure of corporate memory that caused the failure to respond? Christie was not alone in failing to make the connection between the evolving Power Station and its potential impact on the Observatory. What questions if any were asked by the two Chief Assistants, Frank Dyson and Philip Cowell? The Board of Visitors, who always held their annual meeting at the Observatory, were most certainly asleep on the job. 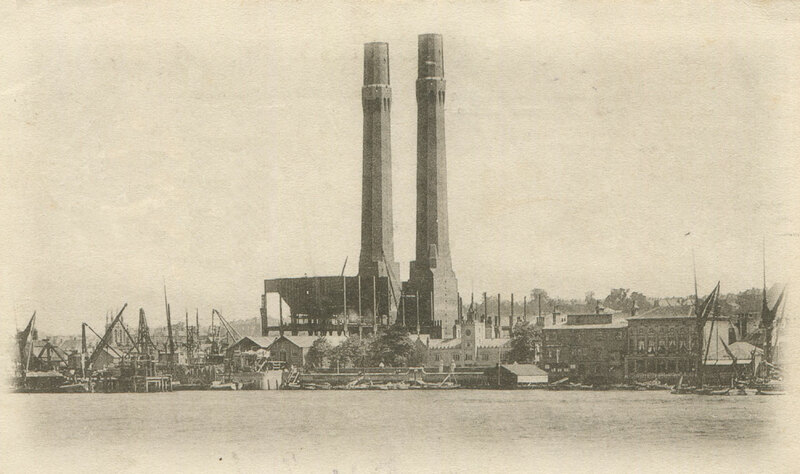 At their meeting in June 1903, they too would have seen the chimneys under construction. 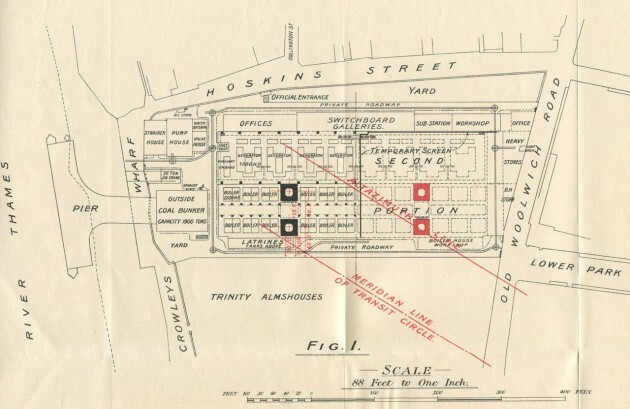 By the time of their 1904 meeting, the chimneys would have been completed and by the time of the 1905 meeting, the whole of the external works of phase one would have been coming to an end. Even if they had failed to notice the Power Station’s looming presence on their way to and from the Observatory, they can hardly have failed to notice it from the vantage point of the Octagon Room where their meetings were held. Regrettably, the minutes of the meetings of the Board are, as a matter of course, somewhat rudimentary. As such, they shed no light on what may or may not have been discussed on either a formal or an informal basis. It is apparent from Turner’s letter to The Times (above) that the function of the Board as he (and presumably they) saw it, was largely to act as a sounding board for the Astronomer Royal and then to pass any appropriate resolutions. It does not seem to have occurred to him that the Board itself could (and should) have taken action an awful lot earlier. The terms of reference of the Parliamentary inquiry were entirely about finding a resolution to the problems of the Observatory and the L.C.C. The Board of Visitors was never held to account and it was arguably to the long term detriment of the Observatory, that there was not a parallel inquiry into their role and the way in which they were constituted to see if they were still fit for purpose. It is hard to believe that a board with such a narrow range of interests would be allowed to exist today. Stress & illness – a possible explanation for Christie’s slowness to react? 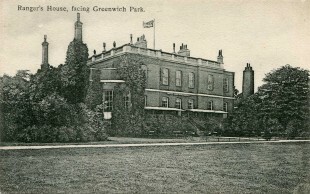 By the start of the twentieth century, Christie’s building programme at Greenwich had come to an end. With the new telescopes and facilities, came a significant increase in both the range and amount of work being done. With high staff turnover amongst the temporary computers, Christie came under considerable personal pressure which inevitably took its toll. Shortly before the meeting of the Board in 1905, Christie was ordered by his doctor to give up his work immediately, leave Greenwich, live in the open air and give up his duties and responsibilities altogether (ADM190/16). The physician’s report sent to the Board’s Chairman, Sir William Huggins, stated amongst other things that his capacity for work was small and for sustained work was nil. His reported symptoms suggest he was suffering from a combination of stress and heart failure. As a result, he missed the annual meeting of the Board. According to Dyson, the illness was a repeat of one that he had had a few years earlier. Reading between the lines, it seems likely that Christie was afflicted throughout his last ten years as Astronomer Royal. Records are scanty, but we do know that the 1910 visitation was postponed by two weeks because of his illness (RGO190/7). We also know from what Turner wrote in his obituary, that Christie lacked energy in his later years. This would have affected his ability to lead effectively and was almost certainly something of which the Visitors were aware, even though it is never formally alluded to in their records. Some of Christie’s arguments do not necessarily stand up to scrutiny. As Astronomer Royal his authority was efectively deemed not open to question. Below are some of the areas where he might have been probed or challenged more deeply. Having said all that, the only recommendation of the Parliamentary Committee that might have been different is that the two southerly chimneys might not have been a problem had they been built to full height. However, given the economics of completing them to the full height and then lowering them again after two years if they were indeed a problem, the solution adopted to finish them at 182 feet was certainly the pragmatic one. Although no one ever asked, it is worth noting that the Airy Transit Circle was never able to observe right down to the Horizon. To the north, lay the summit of Pole hill. At a distance of about 11 miles, its height was almost exactly 300 feet above sea level (more when the height of the trees were included). To the south, at the same height above sea level as the Observatory and at a distance of just 480 metres, lay the Ranger’s House. If tree growth on the line of the meridian between the telescope and The Ranger’s House had not been cleared, this may well have been more significant in terms of how low to the southern horizon the telescope could be pointed. 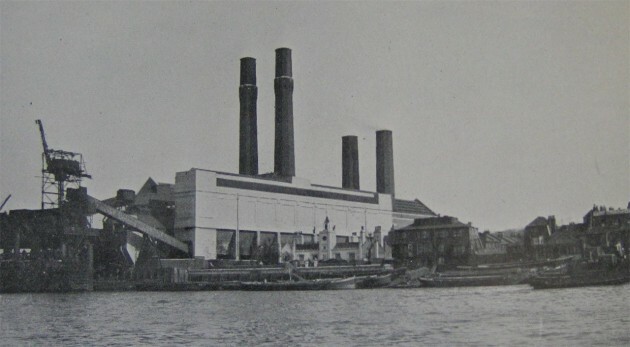 Deptford Power Station supplied its first electricity in November 1889. A few weeks earlier however, on 26 September, the mercury trough of the Airy Transit Circle had been furnished with a bottom of amalgamated copper in an attempt to damp out the disturbing effects of tremors attributed to passing railway trains and road traffic (RGO7/29). A similar change to the trough of the Reflex Zenith Tube had previously been made on 13 February 1889 (RGO7/29). The change to the Transit Circle produced very beneficial results as regards steadiness of the images and as a result, the trough was replaced by one of amalgamated copper the following year. The modified design may also have had an effect on any vibrations arising from Deptford. Christie’s claim therefore that the Power Station had run with no discernable effect on the Observatory whilst being true, was potentially misleading. Christie’s Altazimuth was erected in 1896. Essentially a reversible transit circle, it could be set up to point not only along the meridian, but at different predetermined angles (azimuths) to it. Its main purpose was to make extra-meridian observations of the Moon, especially around the time of New Moon when it was close to the Sun and impossible to observe as it crossed the meridian. When used in this mode, the presence of the Power Station chimney would have been an irrelevance. Questions about the mode of use of the Altazimuth were never asked. Nor were questions about its effectiveness or reliability. The supposed importance of the 1884 International Meridian Conference and the so-called international obligations was somewhat over-egged. In 1906, the Airy Transit Circle was in its 56th year of operation. An identical instrument installed at the Cape Observatory in 1855 had just been replaced with one of more modern design. Although there were no immediate plans to replace the Greenwich Instrument, it would inevitably have needed to be replaced at some point. The physical nature of the Greenwich site (and historic precedent) would mean that any new instrument at Greenwich was unlikely to be placed on the same meridian as the old. As it turns out, the Airy Transit Circle ceased to be used to determine the clock errors in 1927 when it was decided to use the small reversible transit instrument in the nearby Transit Pavilion to the west instead. As a result, a small offset to the determined time was applied to bring it into line with the time on the Greenwich Meridian. The other functions of the Airy Transit continued as before until eventually being taken over by the Cooke Reversible Transit Circle, a new telescope that was ordered in 1931 and originally set up in the Christie enclosure some 400 yards to the east of the Greenwich Meridian before being moved to Herstmonceux after the war. It is worth noting too that the determinations of the difference in longitude between the observatories of Greenwich and Paris that were made in 1888, 1892 and 1902 while Christie was Astronomer Royal, were made from two observing stations on different meridians in the Observatory Courtyard and an offset applied to allow for their distance from the Greenwich Meridian. 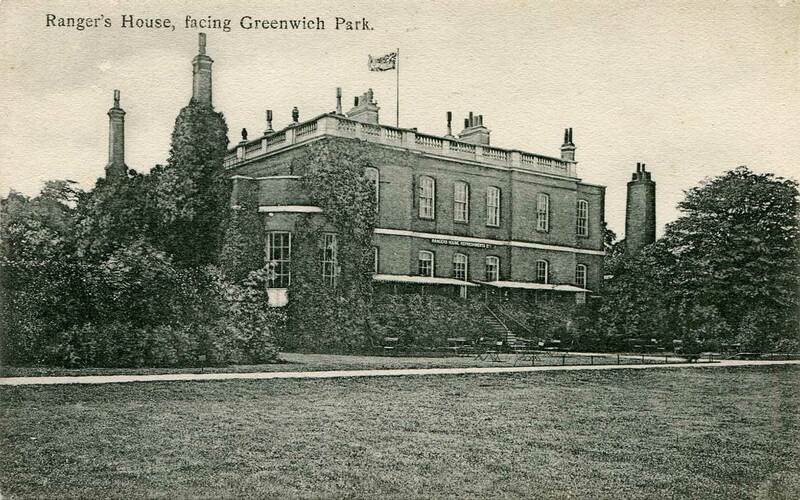 Back in December 1890, small uncountable agitations had begun to be detected in the Horizontal and Vertical Force traces in the Magnetic Observatory at Greenwich. These corresponded to similar disturbances detected by the Earth Current registers. They started around 7 o’clock in the morning, ended around 11 o’clock at night, and were generally absent on Sundays. The following summer it was eventually realised that they were caused by the City and South London Railway (now part of the Northern Line) which ran from Stockwell to the City of London. Four years in the making, the railway was the first electric railway in London. Officially opened by the Prince of Wales on 4 November 1890, it opened to the public on 18 December. It operated at 500V DC using an insulated third rail to deliver the current, with the return being via the uninsulated running rails. 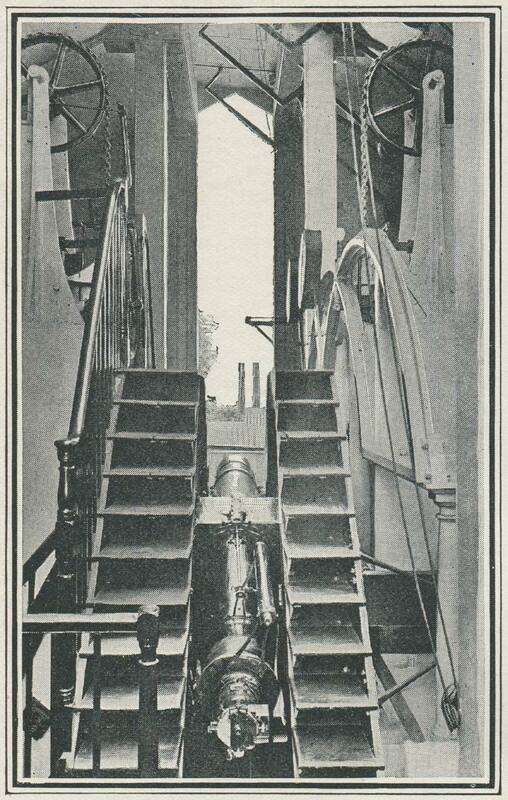 Although the 1902 Act did not in itself provide the Observatory with any protection, had the dispute with the L.C.C. gone to litigation, Christie suggested that this clause, which had been included in other acts and was designed to protect the observatory from the use and leakage of electrictity, could be invoked on the grounds that test experiments had showed that when the electricity from the Power Station was used with a constant load the vibration was smaller than when it was with the variable load of the tramways. Since it was the use of electricity for the tramways that caused the excessive vibration, the generation of the electricity could not, so Christie argued, be dissociated from it. (RGO7/66). 3) that no further development of the station would take place. 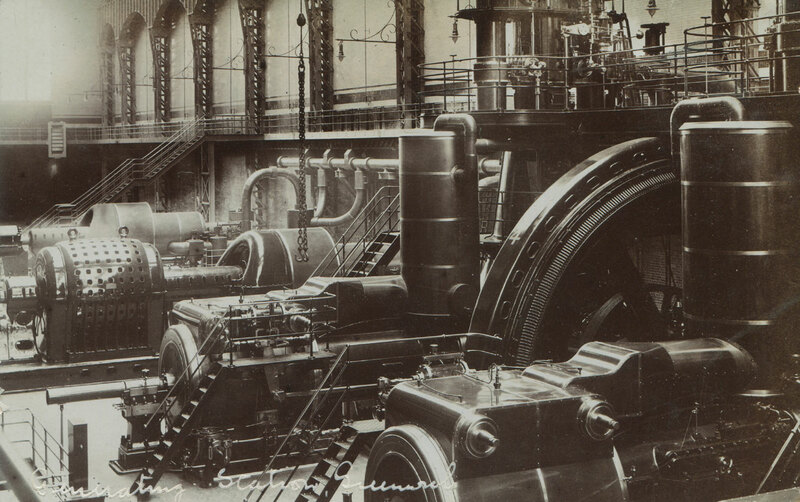 Although agreement was reached in 1913, it took until 1922 for the last of the reciprocating engines to be replaced. A few years later, in around 1927, a run of reinforced concrete high level reserve coal bunkers were built on the west side of the boiler house. Regrettably, as with the lowering of the southern chimneys, the architectural integrity of the original design was severely compromised in the process. Originally painted white, the bunkers still survive but have been black in colour since remedial work was carried out on them in 2013. In 1930, a programme of modernisation began that involved the replacement of the turbine generators with new turbo-alternators of higher output. When the London Passenger Transport Board (London Transport) was formed in 1933, control of the power station passed to it from the L.C.C. Over the following years further upgrades took place in part to meet the change in demand for electricity. Between 1969 and 1972, the power station underwent a complete modernisation programme, with the coal-fired boilers and generators being replaced by eight gas turbine alternators fired by oil and the two northern chimneys being reduced to the same height as the others. 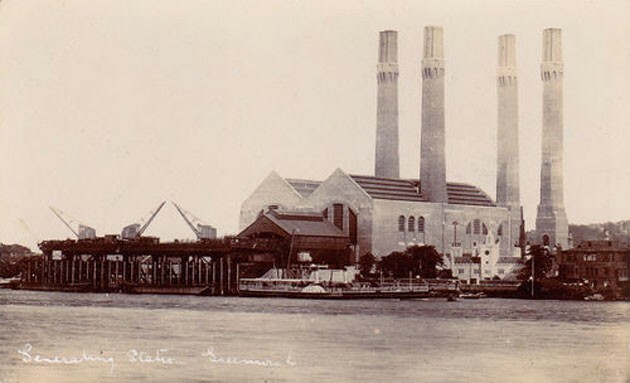 From that time onwards, the power station served as a backup to London Transport’s Lots Road Generating Station at Chelsea which had originally been opened in 1905 to serve part of the underground network. In 1998 London Underground shut Lots Road and switched to the National Grid for its power supplies. 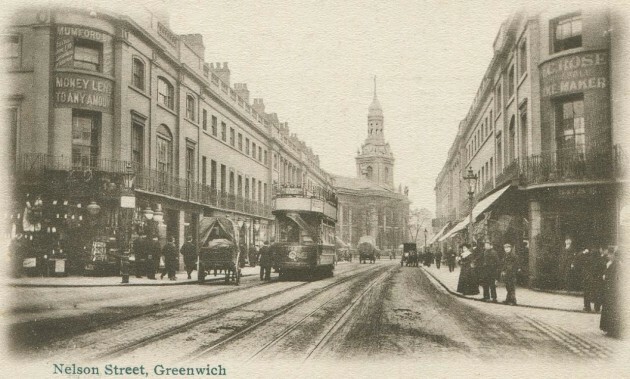 At this point, the role of Greenwich changed, with the station becoming the provider of emergency power to the London Underground. In 2015, the then Mayor of London, Boris Johnson, announced plans to install six new gas engines and introduce a district heating scheme for nearby homes and buildings. Although the scheme did not require planning permission, it did require approval by the Environment Agency to whom the proposal was submitted. Following local objections that the scheme would increase air pollution by adding to the already high levels of Nitrogen oxide, the proposal was withdrawn at the end of 2016 ‘to allow time for a review of the project to ensure it aligns with the priorities of the new Mayoral administration’. 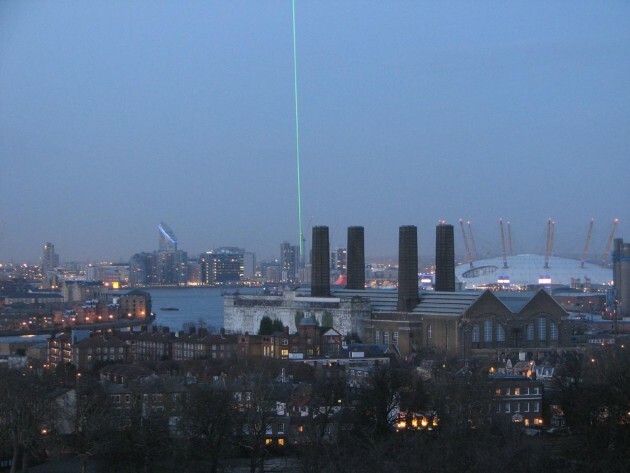 Although the problems caused by the siting of the Power Station on the Greenwich Meridian were well reported in 1906, they are scarcely mentioned in later accounts and histories. One recent paper (described elsewhere as ‘seminal’) makes no mention at all of the Greenwich Meridian and has only the briefest of mentions of the Observatory. Likewise the considerably shorter article in Wikipedia (accessed March 2017). That this should be so is probably due to an over-reliance on the accounts that were published in connection with the opening of phase one in 1906. These all pre-date the very public debate that followed soon after. The image reproduced courtesy of Cambridge Digital Library has been reduced in size and is more compressed than the original and has been reproduced under the terms of a Creative Commons Attribution-NonCommercial 3.0 Unported License.